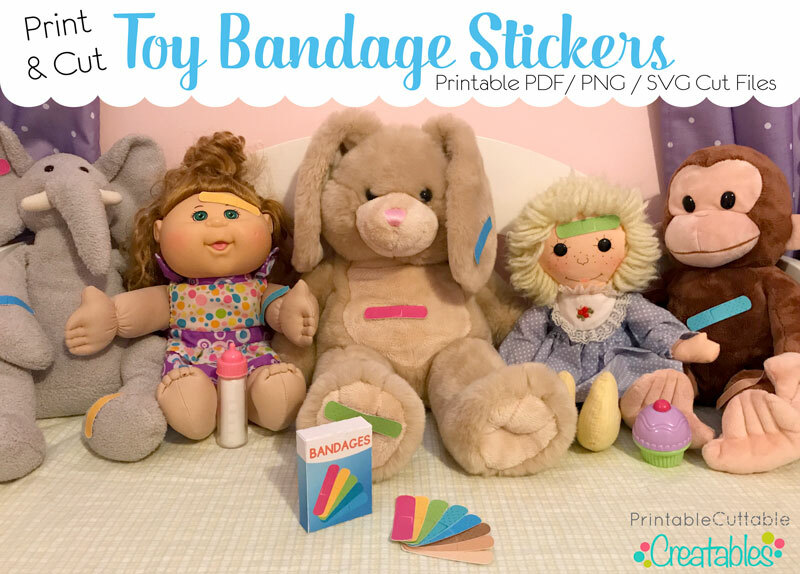 Printable Toy Bandage Stickers for Pretend Play! When I caught my 5 and 2-year-old daughters trying to put real Band-Aids all over their baby dolls, as cute as it was, you know I couldn’t let that fly! 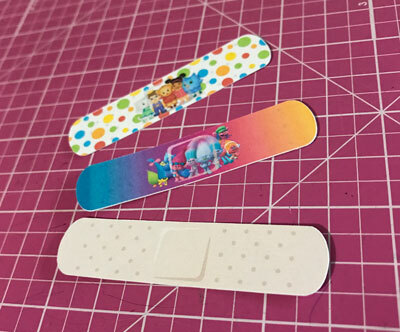 While those licensed character Band-Aids don’t break the bank for the occasional real “boo-boo”, 3 or 4+ Band-Aids per doll, per child adds up pretty fast! Then, a familiar little voice went off in my head. You know, the one that says “I can make that!”. So as I tucked the real box of Band-Aids safely away from their reach, I told my girls, “Mama’s going to make you some toy bandage stickers that you can use for your dollies’ “ouchies”. They were both very excited about this idea, and wanted to watch & help make them! You can download the DIY Printable Bandage Stickers SVG / PDF / PNG Files right from my shop, but first, read on to see how I made them! 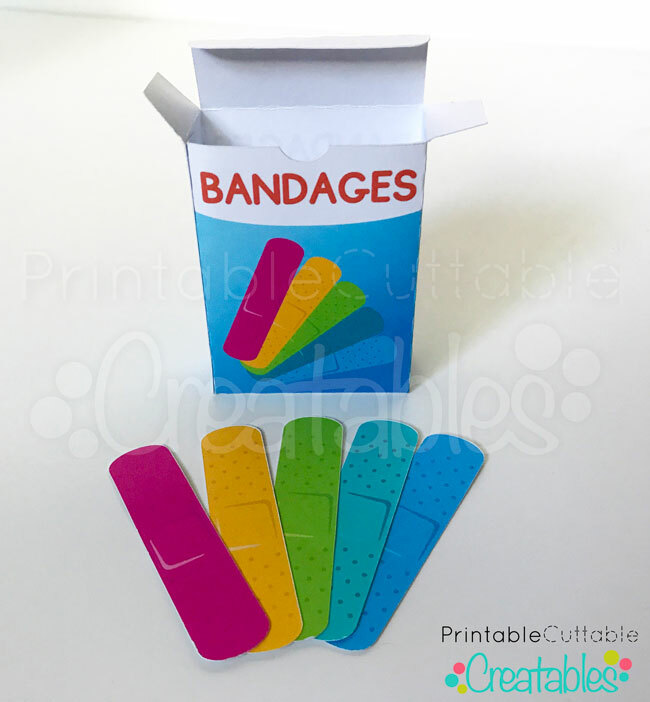 So I set to work in Adobe Illustrator (my design software of choice) and came up with these fun and colorful play bandage stickers, and a little 3D bandage box to boot! 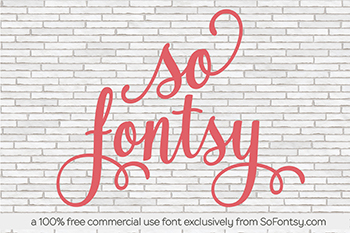 It was fun, but took longer than it should have – it’s not so easy trying to design with a 2 year old literally climbing on your back like a monkey up a tree! I brought the SVG into Silhouette Studio and squeezed as many bandage stickers as I could on a sheet for Print & Cut, and sent them to print! 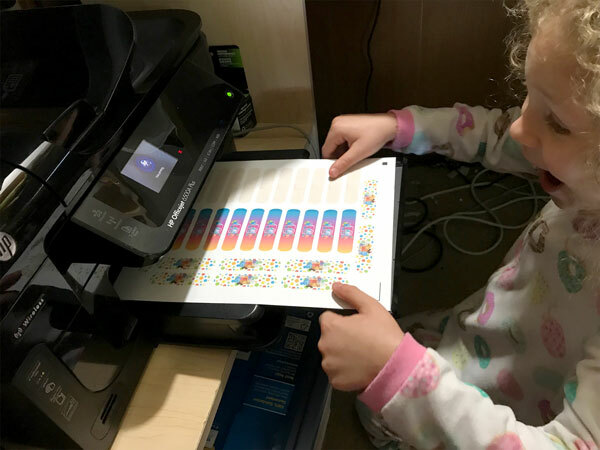 Check out my 5 year old’s excitement as they printed – everything is so fun at this age! For the toy bandage stickers, I used Avery Printable Shipping Labels as a more budget-friendly for this particular disposable project. Their better quality Printable Sticker Paper is also a great choice. 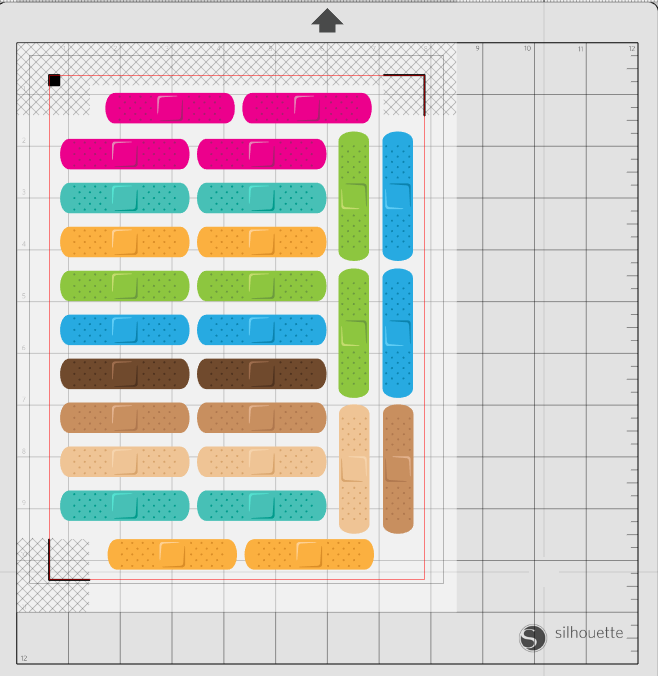 To set up a Print & Cut file in Silhouette Studio, open up the SVG bandage file and turn on the registration marks (pressing the ‘M’ key on your keyboard is the fastest way to bring them up). 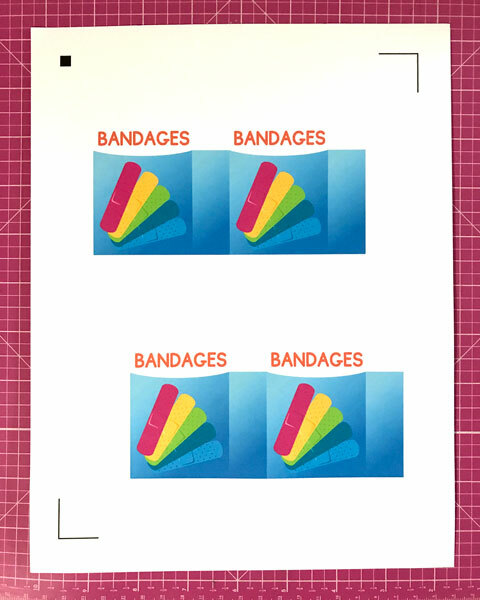 Choose the bandage colors you want to use, and make enough copies to fill up the page. 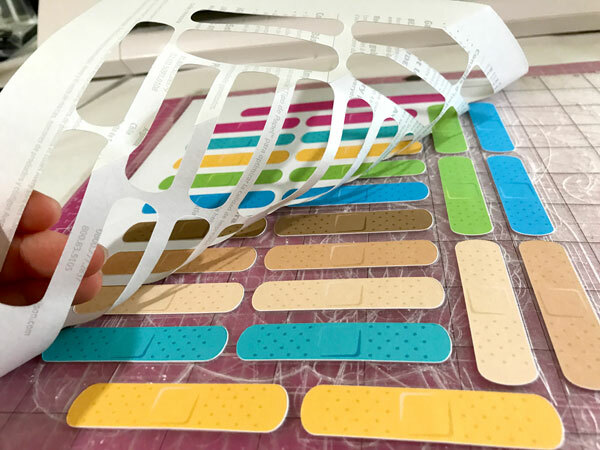 Make sure you leave some space between each bandage shape to prevent tearing during the cutting phase, and keep the shapes inside the white registration mark area shown on your workspace. When you’ve got the page filled up to your liking, go ahead and send it to your printer! 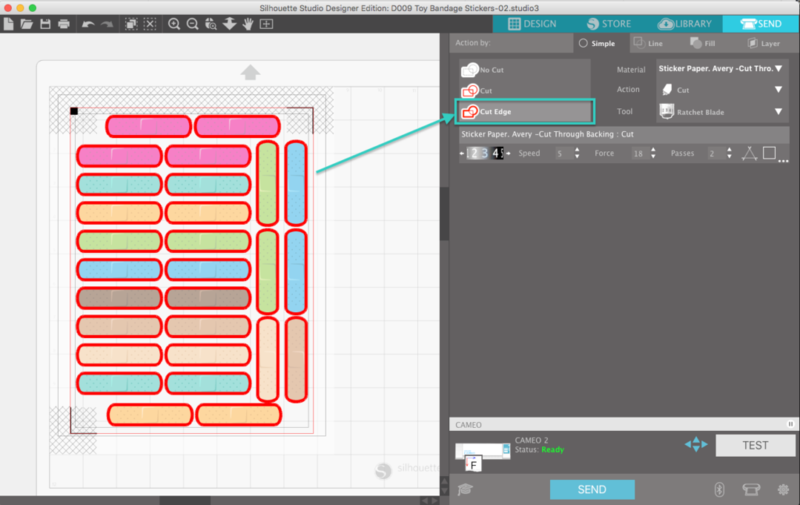 Important: After your Print & Cut layout is ready to print, DO NOT move or change any elements in the file! I always make sure to save the file right before I print it, and don’t make any changes to the layout once it has been printed. 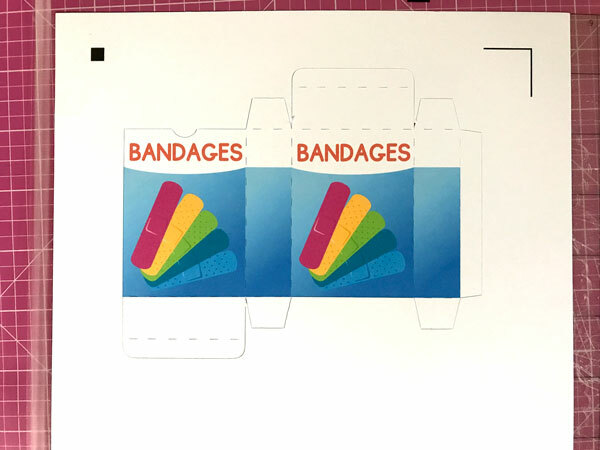 To cut the toy bandage stickers as individual strips, I started with the “Sticker Paper White” cut settings and adjusted them to cut all the way through the sticker backing (instead of a kiss cut, like with most stickers). The settings I used were Blade: 3, Speed: 5, Thickness 18, Double Cut (2 passes). 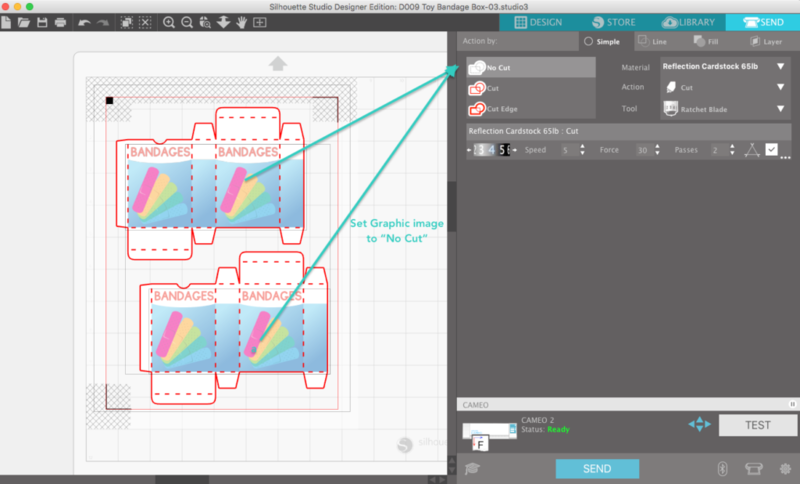 In Silhouette Studio, make sure to select all of the bandage shapes and set them to “Cut Edge”. Don’t forget to do a Test Cut first, to make sure your machine is cutting all the way through the sticker paper backing. I printed the bandage box on regular white 65lb cardstock, because it’s what I had on hand, but you might want to use a heavier 110lb cover stock to make the box more durable for playtime. When the box design is printed, you won’t see the box outlines or score lines, you’ll only see the graphic. But don’t worry, as long as you don’t change anything in your cut file after printing, it will cut and score just fine! For the 65lb cardstock, I used the following settings: Blade: 4, Speed: 8, Thickness: 30, Double Cut (2 passes). You may need to adjust your settings depending on your machine and the materials you choose. 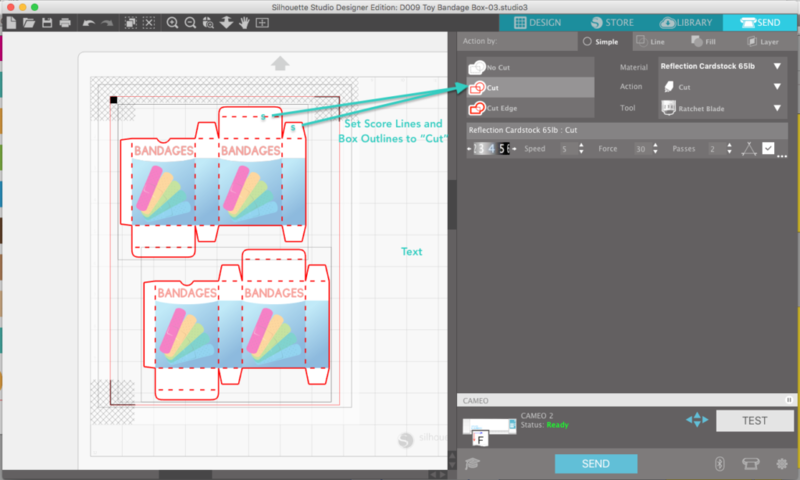 If you’re using a bandage box graphic like the one I included, make sure it is set to “No Cut”, while the box template outline and score lines are set to “Cut”. Here it is, all cut and scored! Fold along the score lines, add a few swipes of the adhesive tape runner or glue stick, and you’re good to go! These turned out pretty cute and I had fun making this quick project with my girls, though not nearly as much fun as they had playing doctor with their dolls! Fun idea: Change up the colors on the bandages, add some fill patterns, gradients, or even some of their favorite characters! If you want to add characters, make sure to search “png” to find character images with transparent backgrounds! For example, I searched “Trolls png” and “Daniel Tiger png” to make these character versions for my girls. Thanks for stopping by to check out this fun print & cut sticker project! If you make a set of toy bandage stickers for your little ones to play with, don’t forget to share your creation on my Facebook page! I’m so excited to try these out and send to sick kids in the hospital. What a super cute idea! Thanks!!! What a sweet cause to make these for! Thank you Terri!